Do I Have a Furnace, a Boiler, or a Heat Pump? What’s the Difference between a Furnace and a Boiler and a Heat Pump? Which Heating System Do I Have in My Home? So you know you have a heating system in your home, but do you know a boiler from a furnace? And what exactly is a heat pump, and how is that different from the other two? Don’t worry, you’re not alone - these are common questions we often hear from our customers in the Lehigh Valley, and in Harrisburg, PA, and in Berks County, PA, and in Lancaster, PA, and Montgomery and Chester Counties, PA - pretty much everywhere. We’re here to help you figure out what type of heating system you have in your home. Do You Have Ducts or Radiators? The easiest way to determine what type of heating system you have in your Pennsylvania home is to determine whether you have ducts that carry the warm or cool air or if you have baseboard or radiators that carry the warm water or steam in your home. If you home has ductwork you have a forced air system, indicating that you are heating the house with either a furnace or a heat pump. 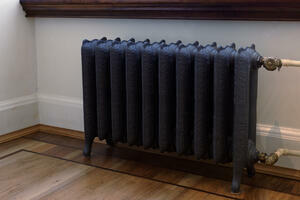 If you have baseboard or radiators in your home, you are heating with a boiler. A boiler heats your home with hot water or steam. In addition to traditional baseboard or radiators, other form of distributing heat from a boiler system include steam radiators and radiant heat floor systems. A boiler can be fueled by natural gas, propane, electricity or oil. A boiler heats water that flows through pipes in the home and into baseboard or radiators, which, in turn, heat the room. This is called “radiant heat”. 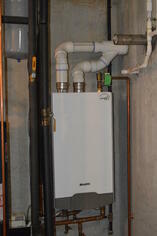 Many boiler systems are also set up to use the same boiler unit to heat your home’s domestic hot water. These combination systems are often referred to as “combi-boilers” and eliminate the need for a separate water heater tank. If you have a boiler, regular maintenance will include bleeding air from the system and an annual cleaning and inspection from a reputable HVAC company. How Can I Tell the Difference between a Heat Pump and a Furnace? If the heat in your home comes through the ductwork, you are likely using a furnace or a heat pump. So how can you tell the difference? The easiest way to make the distinction is to know if the same system does both the heating and the air conditioning. If it does both, you have a heat pump. If it does not, you have a furnace (and, possibly, a separate central air conditioning system). Still not sure? A heat pump will have both an indoor unit, called an air handler, and an outdoor unit, called a condenser. A heat pump’s outdoor condenser will look very similar to a central air conditioner, so how can you tell the difference? In a heat pump system, the outdoor unit will work when heating the home. So you can switch your thermostat to heating, and simply go outside to see if the outdoor unit is running. If so, it’s a heat pump (which does both heating and cooling). If not, it’s just an air conditioning unit. If you heat your home with forced warm air through either a heat pump or a furnace, your system has an air filter that needs to be changed on a regular basis. Most standard filters should be changed monthly, though many homes have an upgraded filter system that allows for quarterly or semi-annual filter changes. You should also have an annual cleaning and inspection to keep your system running at top performance. A heat pump is seen by many homeowners simply as an air conditioner that also heats the home, but there’s a little more to them than that. Heat pumps are able to heat the air by removing heat from the air (an “air source heat pump”) or from the ground (a “ground source heat pump”) using electricity and a refrigerant. Heat pumps save energy in colder months by taking the heat in the air or the ground and transferring it into the home. In the summer time, a heat pump works in reverse by removing the heat from inside your house in order to cool the home. Most heat pumps will also have an “auxiliary heat” option that will generate heat with electricity or a fossil fuel back-up when needed – usually just on the coldest of days or when running in the defrost mode. When the heat pump can’t get enough heat from the air or ground and has to generate heat, your energy efficiencies go down as you use more electricity. You can also purchase a hybrid system which allows you to run the heat pump down to a certain outdoor temperature and revert to the fossil fuel furnace when lower temperature is present. A heat pump typically cost more than a furnace, but may be less than purchasing both a furnace and separate central air system. Heat pumps tend to have a shorter life span, simply for the fact that they run year round. So What Type of Heating System Should I Choose? Typically, if you’re replacing your existing heating system, you will likely stick with a similar type of equipment – though the newer models will certainly have more bells and whistles and a much greater energy efficiency. But in many cases changing system types or converting fuel sources – switching from oil to natural gas, for example – may make sense for you and your home. If you home currently has a boiler, and no ductwork, you would have to retro-fit ductwork into your home if you wanted to convert to a furnace or heat pump. This is certainly a viable option, but it may add significantly to your installation costs. If you already have the ductwork for your central air system, you may be able to utilize the existing ducts to keep some costs down. 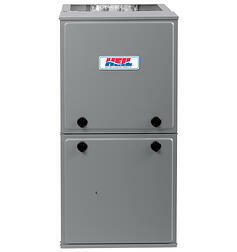 When choosing between a furnace and a heat pump, most people who have access to natural gas will opt for a gas furnace. Natural gas is clean-burning, efficient, and easily accessible. And, due to the fact that natural gas is now easily and abundantly produced in the US – right here in Pennsylvania, in fact – prices are expected to stay low for decades to come. 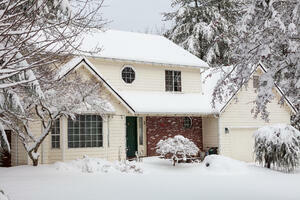 If natural gas is not available in your neighborhood, a heat pump may be the best option for you. While electricity prices tend to be higher than some other fuel sources, the energy efficiency of a heat pump will save you money over an electric furnace, because the heat pump uses heat already in the air whenever possible. Another option for those who do not have natural gas is to install a propane-fired furnace. This has many of the same benefits of a natural gas furnace – it’s clean and efficient - but will require a propane tank and regular fuel deliveries. But adding this fuel source to your home will also allow you have the option of adding other propane appliances like an IE range, fireplace, dryer, water heater or outdoor equipment like grills, fire pits, and pool heaters. If you’re ready to replace your existing heating system, or just want to discuss what options you have, reach out to the experts at UGI Heating, Cooling & Plumbing. We offer free in-home estimates and can help you with various financing and rebate options to make your heating system upgrade fit your budget. Rely on UGI Heating, Cooling & Plumbing for all of your whole-home HVAC needs in and around Lancaster, PA, Reading, PA, Harrisburg, PA, and in the Lehigh Valley, PA. Switching to natural gas can help you save $1,000 or more annually. Click here to calculate real savings! and be the first to know about new special offers! Our technicians repair and maintain all makes and models of home comfort systems. Click here to schedule service. Many financing and rebate options available for the purchase of heating and cooling equipment. Click for details.